Ever get a preconceived notion about a player for no apparent reason? That player is simply bad or good in your mind despite the fact you know nothing tangible about them? That’s how I was with Brandon League. Two years ago I had him on my fantasy league and watched him come close to or actually blow week after week for me in fantasy. From that point on I decided Brandon League was bad. In my little defense, League was pretty awful in 2013. He posted an ugly 5.30 ERA to accompany an even worse ERA+ of 68, a whopping 32 points below league average. This my friends, is not good. However, the two years before he posted a 2.79 ERA and 3.13 ERA which is pretty solid for a reliever. In other words, he has a track record for success, at least before 2013. Well 2014 was some kind of year for League. He pitched a lights out 2.57 ERA good for an ERA+ of 136 in 63.0 IP. This my friends is better than ex-Yankee David Robertson who posted a 3.08 ERA and 126 ERA+ in 64.1 IP. In other words, League was straight filthy this year and better than the Yankee closer. Why am I discussing this all though? 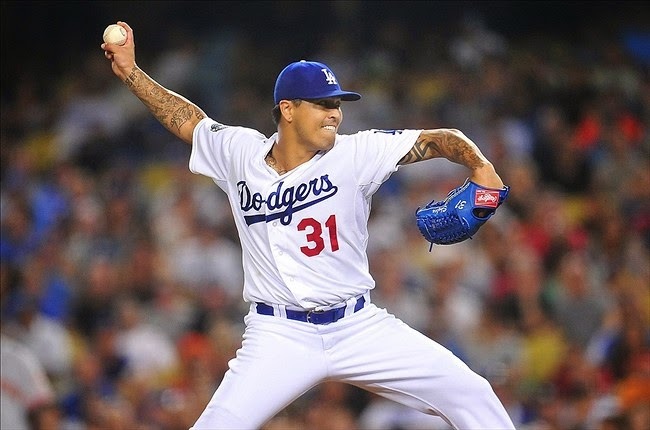 What relevance does a Dodger reliever have to the Yankees? Recently it has been reported the Dodgers are looking to deal League to teams in the league (no pun intended) and what better team to talk to than our New York Yankees? The Yankees appear to be out on big name starters this offseason. The proof of this can be seen in the decision to not make Brandon McCarthy an offer and publically stating Max Scherzer isn’t likely (this is either a smart negotiating move or incredibly stupid). Chris Capuano was re-signed to a one year deal today and if he and Bryan Mitchell/Adam Warren are seen as the guys to fix the holes in the rotation this team is in serious, serious trouble. It’s not rocket science. When you have a less than stellar rotation you need a strong bullpen which the Yankees have shown some interest in doing. With the addition of Andrew Miller alongside Dellin Betances the Yankees likely have the best 1-2 punch in all of baseball to handle the 8th and 9th innings. However, what if you could add a guy to lock down the 7th and shorten the game for those starters to 6 IP? Don’t think this is a great idea? Look at what it did for the Royals. It took a team that hadn’t so much as made the playoffs in years to the World Series. Their rotation was certainly above average, but not the best and the Yankees can recreate this three headed beast type approach with the addition of League. I already outlined just how solid he’s been the last three of four years, thus I don’t think there’s any legitimate fear of regression or performance questions. 2013 appears to be merely a blip on the radar in what has otherwise been a strong career for the righty. Additionally Fangraphs.com shows League’s average was a blip below 95mph this year which is solid for a 31 year old. League is signed through 2015 with a player option for 2016 that becomes guaranteed if he pitches in 55 games the year before. In other words, he’s a young talent with control long enough to have an impact, but short enough to not be incredibly harmful if things somehow go wrong, especially at only $4.5mil/yr. Adding League to the Yankees bullpen mix would create a 7th, 8th, 9th setup that would have a combined 1.99 ERA and ERA+ of 202. This man friends is absolutely incredible. If the Yankees can create a bullpen so dominant runs are seldom scored after the 6th inning, it should be done, especially considering the increasingly unlikelihood the Yankees create a major league caliber starting rotation. We now understand why League should be added, but of course, the question has to be asked, how much will it cost in a trade? I would have to think the Dodgers aren’t just going to give away a reliever this good with potentially two years of control away for nothing, especially considering his low annual salary. Perhaps a C or B prospect or two gets it done. It’s really difficult to judge trade value this offseason, especially considering how each team seems to have an absolutely different view of value than the next. I think a guy like Adam Warren straight up and some cash would get it done. Warren has been decent, but I don’t think he has an incredibly high ceiling. Perhaps a team like the Dodgers would buy into his ability to turn into a setup man or starter. Who knows? I would certainly trade him for League without thinking though. In conclusion this is a trade I feel could actually have some potential. With Sergio Romo and Luke Gregorson out of the mix the market for solid relievers is suddenly shallow. Sure Jason Grilli is out there, but why not go with a younger and more sure thing in League? Cashman needs to get moving in the right direction and this would be a great step towards doing so. Stay tuned for more Potential Pinstripe player profiles. Follow me @RealYanksFans for more news and opinions on the Yankees. Came to check out your blog. Overall not a bad article, but you can't have the name Phelps in there as a rotation candidate when he was traded before this article was written. Thank you for your reading and feeback. To your point on Phelps, he was not mentioned in this entire article.